The devastating ‘assault truck’ attack levied against Nice, France is potentially a part of a larger assault against the whole of Europe. Bastille Day is the French National Day that marks the storming of Bastille during the beginning of the French revolution. It was on this day in 2016, an ‘Assault Truck’ slammed into a large crowd of people and killed roughly 84 individuals. On the very same day, a fireworks truck caught fire underneath the Eiffel Tower and sent smoke billowing up the structure which gave the appearance that the Eiffel Tower was set a blaze. A Compilation of Graphic Video of the ‘Assault Truck’ is shown below. Timing is everything. Hollande announced on July 14th, 2016 that France would lift the ‘state of emergency’ on July 26th, 2016. However in light of the recent terror strike, France will extend the state of emergency. The military presence has only gotten worse in France since the Paris terror attacks in January 2016. The recent attack will only add more stress to an already volatile situation. According to Patrick Calvary, the head of the General Directorate for Internal Security (DGSI) – France’s equivalent of MI5, France is on the brink of civil war and he cites terrorism as the potential cause. Calvary claims there is evidence that radical Right-wing French groups have been collecting arms in preparation for their own attacks on mosques and synagogues. 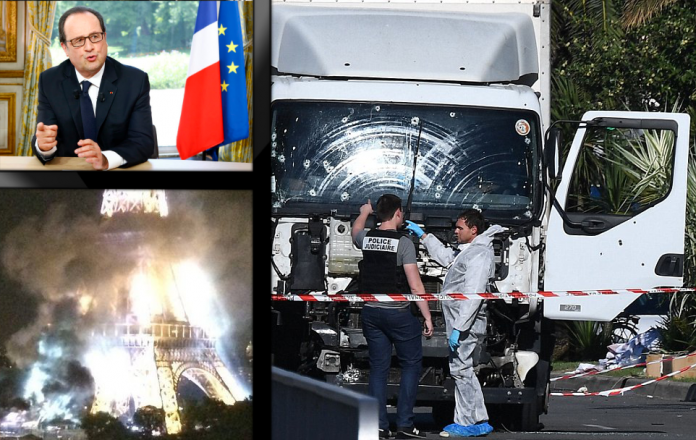 The closed inquiry was held on May 24th, 2016 but the information cited was leaked to French Media on July 11th, 2016; just days before the next mass casualty crisis would strike. Mohamed Lahouaiej Bouhlel, the man who took 84 lives, is an ISIS fanatic. Nice Matin, Mohamed Lahouaiej Bouhlel, was known to the police but not known to the intelligence services. Documents recovered from the ‘Assault Truck’ gave the police the identity to the mass murdering ISIS sympathizer. According to Hollande, before any evidence surfaced, it was obviously terrorism. Again, timing is everything; just hours before the attack Hollande announced that France would lift the ‘state of emergency’ declaration. Which is important because, in order to keep the people under the military’s presence, or a police state, France would need another incident to blame for the extension of the ‘state of emergency.’ Now, France is mobilizing yet more troops to bolster security in an already delicate situation. However, with the concern of the people growing it is becoming painstakingly obvious to the people of France that their government cannot protect them. This, of course, is by design. The underlying agenda set in place on the Brexit day was what is known as the European Superstate. Both France and Germany signed off on the accord to join together all countries of the European Union while citing monetary and security concerns. Under the ES, European Superstate, each state would no longer house their own military and currency. Instead, there would be but one military and one currency. Citing concerns about the importing of conflict, both Germany and France seek to create a united military across the European Superstate. To gain the people’s approval, it would take both financial and security strife. Which is what is ongoing all throughout Europe and was set in motion by the Brexit. The Brexit should spark a “Frexit” because of the constant ‘importation of migrants’ requirement made by the EU. However, with the constant drastic events, the attention is not focused on the hidden agenda but rather the need for security. Which is why in the near future the people of France will potentially make a dire mistake, as will the rest of Europe, and hand over the rest of their national sovereignty. The timing could not be clearer regarding the calculated strike on France’s National day which showcases both symbolism and timing. Two of the requirements in determining the orchestration of a false flag. Europe is under assault by a larger terror sympathizing organization called the Cabal, and they seek to destroy all national sovereignty world wide, to create the New World Order. Previous articleDid the US just agree to allow UN Foreign Troops to police the streets of the USA?